Happy Independence Day! This Fourth of July, I challenge you to consider what is most important in your life--where is your greatest allegiance. 12 Now many signs and wonders were done among the people through the apostles. And they were all together in Solomon’s Portico. 13 None of the rest dared to join them, but the people held them in high esteem. 14 Yet more than ever believers were added to the Lord, great numbers of both men and women, 15 so that they even carried out the sick into the streets, and laid them on cots and mats, in order that Peter’s shadow might fall on some of them as he came by. 16 A great number of people would also gather from the towns around Jerusalem, bringing the sick and those tormented by unclean spirits, and they were all cured. And yet we must always remember, we are “one nation under God” as we say in our pledge of allegiance. For the Christian, our highest allegiance must always be to God, or else, we are not really Christian. God will never take second place in our hearts, in our lives, in our actions, or in our country. And any country that denies God’s ultimate authority cannot long enjoy the blessings of God. My purpose today is to challenge you to reflect on your own truest and highest allegiance. not include the phrase, “one Nation under God”. Instead, it read: I pledge allegiance to the flag of the United States of America, and to the Republic for which it stands, one Nation indivisible, with liberty and justice for all. It was not until 1954 that the phrase “under God” was added to the pledge. Why were the words "under God" added to the pledge? Well, when the pledge was first conceived in the 1800s, everyone assumed Amercia was a country founded upon Judeo-Christian principles. If you were to tell people in the 1800s that God did not exist or that America was not beholden to the Creator, they would have thought you a fool. The notion was generally accepted. Yet by the middle of the 1900s, Christian values were under attack from so many directions, it was felt people needed to be reminded that America was on nation under God. Therefore, a campaign sprang up to add the words to the pledge. Here we are in 2016; more than ever, Americans need to remember that we are one nation under God. If you are to be a Christian—a real Christian, not just someone who calls themselves Christian in name, but one who actually follows Christ wholeheartedly, putting all your hope and trust in Him, and going wherever He leads and obeying His commands—then your first and greatest allegiance must be to God. A person’s allegiances are reveals by their sacrifices. Everyone wants to enjoy the blessings of American citizenship. That is no sacrifice; it is a great benefit to be an American. The citizen who volunteers in their community--who votes, who works tirelessly to make their community better--shows their allegiance to their country. The public servant, who works for our country—often with little or no compensation, who makes decision they believe are right even when they are unpopular—shows their allegiance to America. Perhaps the greatest example is the soldier who goes off to war and lays down his or her life for this country; they have proven their allegiance in the ultimate way. They were willing to die for their country. What about us today? Around three quarters of Americans claim they are Christians. That’s not surprising. It is the default “religion” of our land. If you live here, you most likely were born into a Christian family. And there are benefits in America to claiming allegiance to Christ. There is social acceptance for people claiming to be Christians. (This is rapidly changing as Christian receive more and more scorn for their beliefs each year--especially when those beliefs are held very devoutly; yet for the most part it is still true that Christians--especially Christians who aren't too zealous in their beliefs--are more socially acceptable to other Americans.) Though America is becoming more diverse and tolerant, you are more likely to get funny looks if you are a Muslim or Hindu than if you are a Christian. If you are a Christian, you are more likely to fit in as you practice the same religious traditions, holidays, etc. as most other Americans. People are more likely to understand you. So there is this benefit if you are a Christian in Americaa--even if you are a nominal Christian. Another benefit is a sense of belonging. If you belong to a church--even loosely--you will feel as though you have a wider community of faith to which you belong. You may even have people check on you or assist you if you are sick or facing trouble. This is another benefit for American Christians. American Christians also have the benefit of a certain assurance that you are a good person, that you will go to heaven, that God will take care of you, etc. I don't say that these are biblically or theologically sound ideas, but these are the generally held beliefs of the average American--if you are a Christian, you are good and if you are good, you will go to heaven. So there is this soothing feeling in being a nominal Christian in America; even though it is a false hope, it provides some relief in this world to those who subscribe to the myth. All these things and more are benefits, not sacrifices. They require little or nothing from the so called Christian. They prove nothing as far as allegiances go. It is in the interest of most American's to claim Christianity as their religion. Yet what allegiances do these “Christians” really have? What do their sacrifices reveal? Are they working for God? Are they willing to uphold the principles of God even when it is unpopular? Even when social pressure to conform is overwhelming? Even if to do so would make them social outcasts in their community? Are they willing to face persecution for Jesus sake? Are they willing to be chased from their homes and lose their jobs because of the way they live for Jesus? Are they willing to pour themselves out teaching about Jesus like the Apostles in the New Testament? Are they willing to be thrown in jail for their message? If somehow they are miraculously released, are they willing to go back and preach the Gospel of Christ again? Are we willing even to be seen as “unpatriotic” or “unAmerican” for the sake of Jesus Christ? Are we willing even to speak out against the injustices of our beloved nation (when necessary)? Are we willing to (in extreme cases) disobey the laws of our land (if those laws are clearly in opposition to God’s Word)? I challenge you to reflect on your allegiances. You may be tempted to answer too quickly. Sure. We all want to believe God comes first in our lives—especially if we are church-goers. But reflect deeper on your life, your attitudes, and your actions. Consider how you spend most of your time and money. What are you most passionate about? Where do you pour out most of your energy? For what are you willing to sacrifice? For what would you suffer? For what would you lay down your life? In these revealing terms, where is your first and greatest allegiance? This is important. It is crucial. For if your allegiance to America is greater than your allegiance to God, America is in deep trouble. Even more important, if your allegiance to America is greater than your allegiance to God, you eternal salvation is in jeopardy. God will not accept second place in your life. God will not accept second place in our nation. Remember what God has done for you. He has given everything for you. John 3:16 - "For God so loved the world that he gave his one and only son so that whoever believes in him would not perish but have eternal life." God gave Jesus to save you from your sins--not because you deserved it, but because you needed it. In return, God deserves nothing less than your complete and full allegiance. He deserves your heart, your devotion, your love. 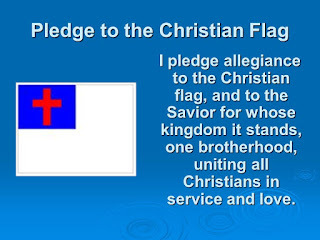 Perhaps it is time to repent and pledge your full allegiance to God throught Jesus Christ.